WILLS POINT, TEXAS (ANS – Nov. 14, 2018) – “When Nature Calls” is the theme of an international campaign to provide essential sanitation. 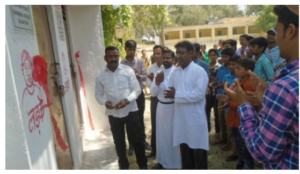 Gospel for Asia says that ribbon-cutting ceremonies typically mark the opening of a grand new building, but in Asia they can even celebrate a more modest, but life-changing construction—of a simple outhouse. The enthusiastically attended formal dedications follow the provision of desperately needed sanitation facilities, often available for use by multiple families, by GFA-supported (Gospel for Asia, www.gfa.org ) workers helping improve the health and quality of life of those in low-income, rural communities. As they are year-round, teams will be engaged in the construction of these outdoor toilets on World Toilet Day (Nov. 19), whose “When Nature Calls” theme spotlights the huge cost of inadequate sanitation. Providing everyone with basic sanitation by 2030 is one of the United Nations’ sustainable development goals. Currently, millions risk sickness and death from disease because they do not have access to a toilet, while women and girls are in danger of assault when forced to find a remote spot in the open to use as a bathroom. Some girls stay home from school because a lack of facilities exposes them to danger. Toilet construction has been part of GFA’s caring work for years, providing such basic essentials as a demonstration of God’s love and care for those on the margins of society. Last year, teams provided almost 6,500 toilets to communities across Asia. Along with installing toilets, GFA-supported workers also drill community wells and distribute water filters, and teach good hygiene practices. That includes promoting the “Swachh Bharat” open-defecation-free campaign—discouraging people from relieving themselves in the open—launched by the Indian government. As evidence of GFA’s major emphasis on providing good sanitation, a new toilet is featured in its 2018 Christmas Gift Catalog (https://www.gfa.org/gift). Although it seems an unlikely gift, just $160 provides an outdoor toilet for families in need. Previous recipients have told of how the provision of a simple toilet has greatly improved their lives. “They provide comfort and convenience with a sense of security and dignity to each member of the house,” said one man.